Shola's foot and Guti's leg: The mystery continues… | NUFC Blog. 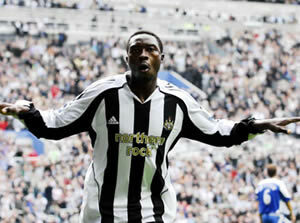 Shola: Stressed foot inspection today. Newcastle United manager, Chris Hughton has given an update on the condition of first team players, Shola Ameobi and Jonas Gutierrez. However there is still some mystery regarding the seriousness of Gutierrez’s leg muscle problem. “Jonas, too, is doubtful for Monday, he has a slight hamstring problem and will be assessed today. Either way, it looks like we will be without our top goalscorer so far, and arguably our best goalmaker so far too for what could prove to be a pretty tough game against Leicester. As for beyond that though, time will tell. Guti’s leg definitely knacked says Argentina doctor. Shola’s foot a mystery. I guess it’s now that the on-pitch problems start. Suprised it took this long tbh. i thought he was injured ?????? Nab but he’s double booked and has a gig with his sisters so can’t make it.